On Saturday, October 3rd, REVERSE will revisit the underground music scene of New York from the 70’s and 80’s by uncovering thousands of recovered records from the avant-garde jazz music label WATT and the experimental music scene of the time. Join us for this musical benefit event where you’ll get free records from this awesome collection, enjoy an open bar and live performances from some of the most interesting artists of the electronic vanguard in Brooklyn, while supporting REVERSE in its mission to create a space for experimental and innovative art. Composer/trumpeter Michael Mantler and his then-wife composer/pianist Carla Bley were instrumental in promoting the idea of self-sufficiency and the development of independent artist-owned record labels within the New York music scene. In 1965 Mantler and Bley founded the Jazz Composer’s Orchestra, an American avant-garde jazz group and shortly after formed the non profit Jazz Composer’s Orchestra Association (JCOA). JCOA Records was created for releases from the Orchestra and its members. The label issued a number of historic recordings by Clifford Thornton, Don Cherry and Roswell Rudd. As an outgrowth of JOCA, in 1972 Bley and Mantler co -founded along with Timothy Marquand, the New Music Distribution Service (NMDS), a non-profit independent record distributor created to dispense experimental contemporary music. It distributed records from several independent labels covering a wide-range of genres, with an emphasis on underground jazz and non-commercial rock bands. NMDS was the first company to support ground-breaking artists like Philip Glass, David Murray, Sonic Youth, the Cowboy Junkie and Glenn Branca. Pioneers in the development of independent artist-owned record labels, Bley and Mantler followed with WATT Records, as a sub-label by JCOA/NDMS, to release their own music. WATT has issued their recordings exclusively since the early 1970s. WATT is now exclusively used for Carla Bley releases and run by Carla Bley and Steve Swallow with manufacturing and distribution by ECM. Years after the closure of NMDS, Karen Mantler, the daughter of Michael Mantler and Carla Bley, decided to leave the Soho loft that housed a large archive of records from the distribution service’s catalogue. During this transition, a large collection of records from JCOA and WATT was donated to REVERSE. We are thrilled by this opportunity to put this collection of records back into circulation, in tandem with our mission to celebrate and nurture sound art and avant-garde music. 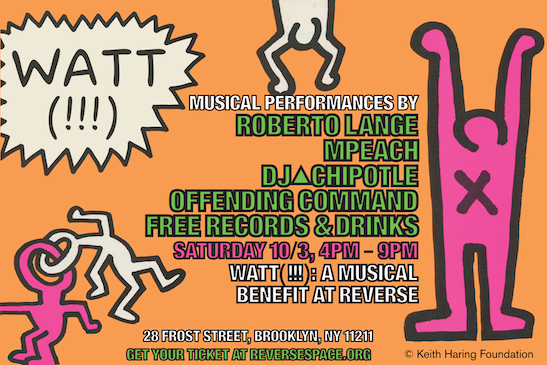 In the spirit of the artistic experimentation and independent endeavors, REVERSE has curated a unique line-up of music and multimedia performances throughout the day, featuring experimental electronic artists Roberto Lange, MPeach, DJ▲CHIPOTLE and Offending Command. General admission is $25 and includes a selection of free vinyl records to take home and access to the open bar. For an additional $40 visitors can get an exclusive catalogue featuring cover artwork made specially by Keith Haring for NMDS in 1986. Join us on Saturday, October 3rd. Come celebrate the spirit of WATT, JCOA and NMDS, explore the collection of thousands of free records, listen to great musical performances, dance a bit and have a drink. And while you’re having fun, help us continue our mission of supporting experimental and innovative art at REVERSE.